A splendid example of noble California womanhood and a lady of accomplishment and pluck, the worthiest possible representative of other worthy Americans long influential for great good in the communities in which they lived and amid the civilization that they helped to guide and develop, is Mrs Morgan Baird, who has a fine home ranch in Fairview that she is bringing to a high state of cultivation. She is the widow of the late Morgan Baird, the honored descendant of the well-known pioneer, Alfred Baird, both of whose careers are also sketched in greater detail in this historical work. At Reno, in Nevada, on January 24, 1898, Mr. Baird married Mrs. Mary (Davis) Givens, a native daughter born near Hornitos, Mariposa County, whose parents were William and Sara J. (Ellis) Davis, natives respectively of Mississippi and Virginia. William Davis was a second cousin of Jefferson Davis, the great leader and president of the Southern Confederacy, and Mrs. Baird is the niece of Mrs. Mary (Davis) Lemberger, a lady remarkable for her advanced age (of over one hundred years) and her clear intellect. William Davis was among the braveest of the early settlers at Millerton, having crossed the plains, and while engaged in the stock business and the raising of sheep he helped put down the Indian insurrections. A grandfather on the mother's side was Dr. T. O. Ellis, a member of an old Virginia family, and the first physician to practice in Fresno County, as he was also the first county superintendent of schools here, and the first man in the entire county to set out a vineyard and an orchard. After the death of Mr. Davis in 1871, his widow made her home near Academy, the beloved mother of six children, grown to maturity: W. T. Davis is a stockman in Fresno County; Jefferson E. Davis is a prominent real estate man in Fresno; Eugene is a stockman at Fort Miller; Mary F. has become Mrs. Baird, the subject of this review; Jack is a stockman in Dry Creek, and W. H. is a viticulturist and horticulturist in Round Mountain. Mrs. Baird received her education in the public schools of Visalia and in a young ladies' seminary at Oakland, where she enjoyed the best of social advantages, in keeping with the traditions of her family. Dr. Ellis, referred to, was highly educated in the classics as well as in medicine, and so was Mrs. Baird's mother, who is a well-educated, cultured and very refined woman, and a favorite in the best circles in Fresno, where she makes her home. 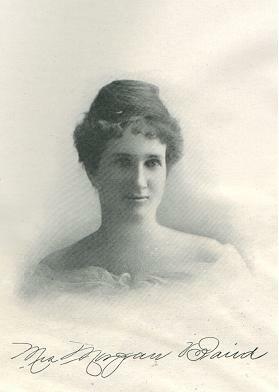 As a result of her marriage with Mr. Givens, Mrs. Morgan Baird has two daughters, Mrs. Edith Baird and Mrs. Hazel Wood, both of whom live in the Fairview district, while through her union with Mr. Baird she is the mother of five children: Walter Addison and Morgan Corwin, both graduates of Fresno High, now attending the University of California; Carroll Hubbard, a student at Fresno High School; and Gordon and Alfreda. During their later years, Mr. and Mrs. Baird were tenderly cared for by their son Morgan and his equally devoted wife, who was and accomplished nurse; and it was only natural that the senior gentleman should appoint Morgan, in his will, as administrator of the estate. As is often the case, one of the benefactors of the will at once proceeded to contest the wishes of the deceased; long litigation followed and naturally the worries incidental to such an unpleasant responsibility undoubtedly had the effect of hastening Morgan Baird's death, which occurred on February 16, 1916. He was prevented, therefore, from further acting in the capacity designated by his father in his last testament, but Mrs. Baird plluckily and properly took up the fight, not merely for the estate, but to vindicate the character and claims of her husband and her father-in-law, who were noted both for their gentlemanly personality and public-spiritedness in the development of this part of the state, and finally she had the satisfaction of witnessing the Supreme Court sustaining the will. Since then she has administered with rare ability the estate and numerous affairs left by her lamented husband, and she is making a great success of farming, both in viticulture and stock-raising. The several thousand acres in the Academy district left Mrs. Baird by her husband, she is devoting to stock and grain farming, and she has a home ranch of 100 acres in Fairview, which she is developing into a vineyard and an olive and fig orchard. Prominent in local social circles, Mrs. Baird also finds a sphere of great usefulness in the activities of the Episcopal Church at Fresno, to which she belongs, as well as to Raisina Chapter, O. E. S., and San Joaquin Court of the Order of Amaranth. With the new spirit of the new century, hailing woman as decidely the equal of man, Fresno County is proud of every such native daughter as Mrs. Benjamin Morgan Baird.